***Audi RS 7 4.0T Quattro Prestige Sedan*** Auto, Sport Diff, Drive Select, 560hp V8 Turbocharged!! 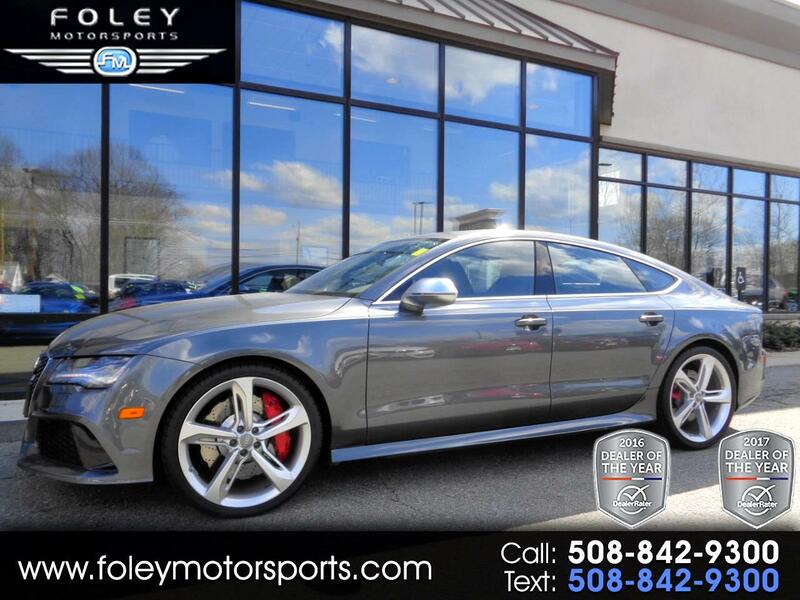 2015 Audi RS 7 4.0T Quattro Prestige Coupe... Daytona Gray Pearl Effect on Black Leather... Only 41,785 Miles!! Well Equipped with 20-inch wheels, LED headlights, an adaptive sport-tuned air suspension, a sport differential, a sunroof, a power liftgate, auto-dimming mirrors, front and rear parking sensors, a basic collision mitigation system (Pre-Sense Basic and Pre-Sense Rear), a blind-spot monitor and keyless entry and ignition. Inside you'll find ambient LED lighting, leather upholstery, heated eight-way power front sport seats (with four-way lumbar adjustment), a power tilt-and-telescoping steering wheel, driver memory settings, four-zone automatic climate control, Audi Drive Select (providing driver control over steering, suspension, transmission and exhaust calibrations), an 8-inch display screen, a rearview camera, voice controls, a navigation system, a head-up display, Bluetooth phone and audio connectivity, Audi connect (providing enhanced Web-based navigation and information services along with WiFi hotspot capability) and a 14-speaker Bose audio system with a CD player, satellite and HD radio and an iPod interface.Please feel free to contact our experienced sales team with ANY questions or to schedule a test drive. Buy with confidence from the area LEADER in Pre-Owned LUXURY. Additional 5 Year/100K Extended Warranty Coverage Available. ALL of our vehicles are meticulously detailed and serviced by our factory trained certified technicians. Call or email us at sales@rjfoley.com **$0 Down** 100% financing available with great rates! Trades are always welcome. National and International shipping quotes are available. Message: Thought you might be interested in this 2015 Audi RS 7.